Writing a Winter menu round up of Brisbane's best restaurants is ill advised when one is supposedly watching one's intake. Lord be with me, I want to eat EVERYTHING that has hit my inbox for the last two weeks. Up at The Barracks in Paddington, The Chelsea is serving up an entrée of sweet and sour eggplant, goats' cheese, pine nuts, roast chilli and flat bread. So good I'd consider turning herbivore. There's also a roast carrot and parsnip salad that looks delicious. 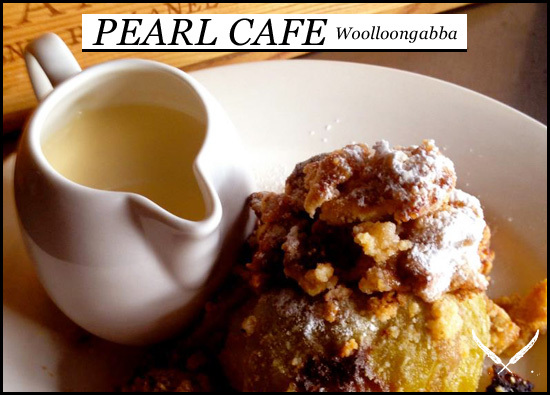 If you're in the mood for sharing, cross the river to Woolloongabba. Pearl Cafe's spiced cauliflower fritters with chickpea aioli and fresh lemon are amazing. Piafon Grey Street in South Brisbane has a beetroot & roast onion tartlet w' goats cheese mousse that is definitely worth your while. Again, head up to The Barracks to The Chelsea for tagine of local Snapper, prawns, mussels, Tunisian spices, toasted couscous and mint yoghurt OR wet polenta with sand crab, sautéed with chilli, lemon and garlic. Down on James Street in Fortitude Valley, Harveys' PJ McMillan serves the perfectly cooked fillet every time. I can vouch for their newly added Atlantic salmon, served with white sweet potato, beans in miso butter, coriander, soy and ginger. Tank Restaurant's salmon also sounds a treat – slow cooked and served with octopus, burnt onion and tosaka (preserved seaweed). 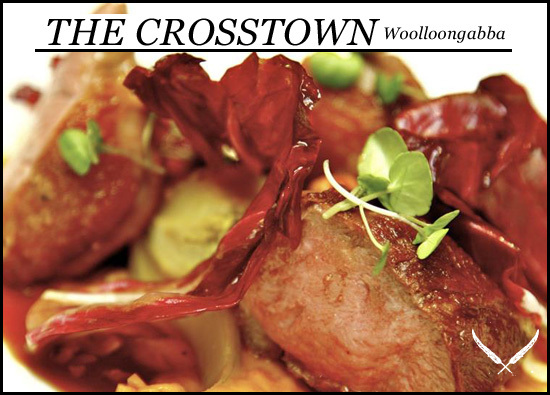 I can vouch for the current menu at Crosstown Eating House for breakfast, lunch and dinner. All three are delicious. My pick from the lunch line up is the roast beetroot and pumpkin salad, with lentils, spiced yoghurt and salsa verde. For dinner, make a beeline for the lamb rump mini roast or pan-roasted duck. Oh, and make sure you order the sticky pork spare ribs to start. Alternatively, swing in for slow roasted beef shin with swede mash, dutch carrots and marrow, just across Logan Road at Pearl in Woolloongabba. Pear is the flavour of the month at Piaf, with rabbit and pork rillette beautifully complimented by house-made pear chutney, golden raisins and toasted baguette. They also have Calvados pork belly with turnip fondant, pear puree, rhubarb & jus. Urbane restaurant's new chef, Alejandro Cancino has launched his first degustation offering. The menu is a 7-course ordeal, and reads surprisingly comprehensibly – no foodie jargon in sight. - Jerusalem artichoke with organic chicken wings. You had me at artichoke. Urbane's bistro brother, The Euro has new a la carte offerings. Fortunately the Cotoleta (veal cutlet) hasn't changed - always a crowd pleaser - but the spatchcock has had an overhaul, now served with deliciously creamy parmesan polenta, sage and brown butter. And then comes the crowning glory. Hands up who else wants to try Tank's grilled short rib of beef, potato croquettes and tamari jus? There's a fair share of delicious sounding confit duck leg floating around. e'cco bistro is serving theirs with pomme purée, radiccio, confit garlic, balsamic & candied walnuts. Harveys' confit duck is done with braised white beans with pickled pork, parsley and mustard pickles. And don't get me started on the beef. Sprout in Auchenflower (hot tip: they're BYO) is always generous with their servings, and the beef filet with black pepper sauce and sweet potato mash is divine. Harveys has opted for Diamantina Angus eye fillet, rubbed with black cardamom, roasted parsnips, green olives and sweet onion jam. Moving away from bistro fare, I always think date night at Ortiga is a treat. Last Friday's highlights were the Galician braised octopus with potato and pimenton, slow cooked duck egg with wild and cultivated mushrooms and Ajo blanco with smoked eel and grapes (I concede this dish isn't new, but it is hands down my favourite). The 1/2kg pot of mussels with crusty bread at Sardine Tin in Southbank has me wanting to go back immediately, if not sooner. The wagyu cheek with vegetables, lemon, curd & liquorice also sounds like a freaking taste sensation, and I'm completely intrigued by the Pedro Ximenez ice cream that comes with the chocolate fondant. If you're feeling game, Harveys has quail saltimbocca with jamon, sage-roasted pumpkin, mustard fruits and spinach. It's an entrée, but I'm sure that if you asked nicely, they'd serve it as a main. If you do head to Pearl, make sure you take friends so you can try multiple desserts. I've got my eye on the ginger crème brulee tart with roasted rhubarb and crème fraiche, baked whole apple with spiced walnut crumble and calvados anglaise, and steamed dark callebaut chocolate and raspberry pudding with vanilla bean ice-cream. And now I'm starving… Where else should I try?